Thus, I Read a Book: Yogiraj Shri Shri Lahiri Mahashaya by Prof Jogesh Chandra Bhattacharya. M. A. PRS. I am reading the book titled "Autobiography of a Yogi" by Shri Yogananda. The flow of reading is being obstructed due to the diction of the narration, especially because of some selection of words and phrases. I have written about that in a post elsewhere. It was during such a halt, it was in chapter six, that I again browsed through the Kindle selling list and downloaded the book on Shri Shyamacharan Lahiri by Prof Bhattacharya. The actual title is spelt above. I am not motivated by any desire to read on spiritualism. My target is to read about Patanjali. I am seeking a book on that topic by Swami Vivekananda. It is a fading glimpse in memory that he had written the finest commentary on Patanjali and Rajyoga. I have acquired the complete writings of Swami Vivekananda by now, but I have yet not read them. I have posted it elsewhere on this very blog that for the last three months, I am reading books on spiritualism. I am devouring them. It is during the phase of such an activity that I have acquired the title, mentioned above, about which I have written this post. The title by Prof. Bhattacharya is the costliest one among all the books, which I have purchased in the last three months. It is the smallest one among all of them. I purchased it on February 8, 2017, and I had completed its reading on February 9, 2017. It is a book by a professor. It has only five chapters, one appendix and Bibliography as written in an older way of writing wherein merely a list is given. It is not a Bibliography essay which is generally found in a case of New Cambridge Series publication and it is now found in the works of other scholars. In the appendix, he has given the theory as propounded by Swami Yukteshwar. Swami Yukteshwar was a disciple of Shri Shamcharan Lahiri. Swami Yukteshwar was the guru of Swami Yogananda, who had authored his "Autobiography of a Yogi". Prof. Bhattacharya had referred to the sources from which he had borrowed the information. In chapter two, he had given the family history to Swami Shamcharan Sandilya Lahiri. 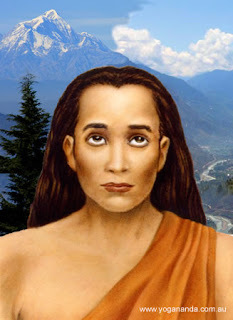 In the third Chapter, he had written about his Diksha and the mysterious Shri Babaji Maharaj, who is known for his youthful looks and believed to be alive even today. The last two chapters are about the life of Shri Shamcharan Lahiri as an enlightened being. The nature of the contents is such, that I have not made a single note on those chapters. The book has just introduced Shri Shamcharan Lahiri. It is only in the last section that there is a content about spiritualism although it is about the theory as propounded by Swami Yukteshwar. Thus I have read this book. One Final Observation: Why was this book published? This book is a typical example of a product of an Indian academician who sometimes writes because he feels like getting something published in his name to show ME TOO. Is it a sincere work? He has discussed the family tree of Shamcharan Sandilya in one chapter. Probably, that was a result of his research. Now if you read "Autobiography of a Yogi", you will learn on your own that his work is a complete 'cut and paste' job. Another author Shri M, and some other Kriya Yoga specialists whose discourses are available on YouTube, emphatically say that it was Mukunda, otherwise revered as Paramhansa Swami Yogananda who was the first person to write about Shamcharan Lahiri. His guru, Swami Yukteshwar, his teacher and even his own father and mother were the direct disciple of Shamcharan Lahiri. The verdict is in your hand. Do not buy this book.